Jim Quinn does such a masterful job of summarizing it that I’ve reprinted his article below in its entirety. I’m not sure about Jim’s prediction about Mitt Romney winning the U.S. Presidency but we’ll know the answer to that shortly. However, I concur heartily with the rest of Jim’s article. Also, my thanks to Blacklisted News for making me aware of Jim’s article. Strauss & Howe wrote these words in 1997. They had predicted the arrival of another Crisis in this time frame in their previous book Generations, written in 1990. This wasn’t guesswork on their part. They understood the dynamics of how generations interact and how the mood of the country shifts every twenty or so years based upon the generational alignment that occurs as predictably as the turning of the seasons. The last generation that lived through the entire previous Crisis from 1929 through 1946 has virtually died off. This always signals the onset of the next Fourth Turning. The housing bubble and its ultimate implosion created the spark for the current Crisis that began in September 2008, with the near meltdown of the worldwide financial system. 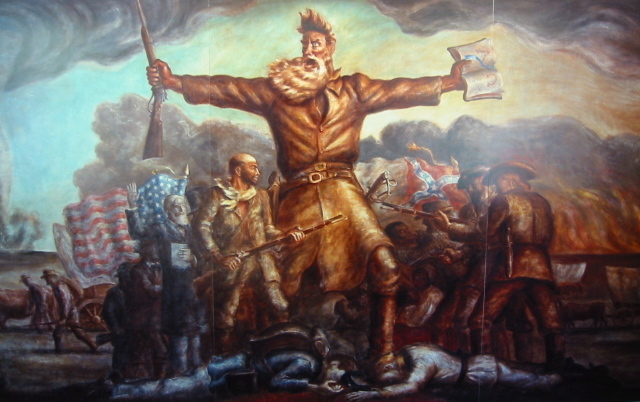 Just as the stock market crash of 1929, the election of Lincoln in 1860, and the Boston Tea Party in 1773 catalyzed a dramatic mood change in the country, the Wall Street created financial collapse in 2008 has ushered in a twenty year period of agony, suffering, war and ultimately the annihilation of the existing social order. We have experienced the American High (Spring) from 1946 until 1964, witnessing America’s ascendancy as a global superpower. We survived the turbulent Consciousness Revolution Awakening (Summer) from 1964 until 1984, as Vietnam era protests morphed into yuppie era greed. The Long Boom/Culture Wars Unraveling (Fall) lasted from Reagan’s Morning in America in 1984 until the 2008 Wall Street/Federal Reserve spawned crash. The pessimism built to a crescendo as worry about rising violence and incivility, widening wealth inequality, and the splitting of the national consensus into extremes on the left and right, led the country into a winter of discontent. The Global Financial Crisis (Winter) has arrived in full fury and is likely to last until the late 2020’s. It will be an era of upheaval, financial turbulence, economic collapse, war, and the complete redefinition of society, as the existing corrupt status quo is swept away in the fury of powerful hurricane winds of change. History is cyclical and we’ve entered the most dangerous season, when the choices we make as a nation will have profound long lasting implications to the lives of future unborn generations. • In 2007, the unemployment rate was 4.6%; 146 million people, or 63% of the working age population, were employed; and 78 million Americans were not in the labor force. Today, after three years of “recovery”, the unemployment rate is 7.9%; 143 million people, or 58.8% of the working age population are employed; and 88 million Americans are not in the labor force. • Real median household income was $55,039 in 2007. It has fallen by 8.2% to $50,502 today. • BLS reported inflation has risen by 12% since 2007. True inflation has risen at twice that rate. • Median net worth in 2007 was $126,400. By 2010 it had fallen to $77,300, a 39% drop in three years. As of today, it may be a few thousand dollars higher as stock prices have risen and home prices have stopped falling. • In 2007 there were 5.7 million existing homes sold at a median price of $218,900. Today there are 4.3 million existing homes being sold at a median price of $183,900. Over 1 million of these home sales are foreclosures or short sales, as 30% of all the homes with a mortgage in the country owe more than their house is worth. • Federal government spending in 2007 was $2.73 trillion. Federal government spending today is $3.8 trillion, a 39% increase in five years. GDP in 2007 was $14.2 trillion. Today GDP is $15.8 trillion, an 11% increase in five years. Approximately 25% of the GDP increase is due to increased government spending. • Government entitlement transfers totaled $1.7 trillion in 2007. Today they total $2.4 trillion, a 41% increase in five years. Interest income paid to senior citizens and savers totaled $1.25 trillion in 2007. Today interest income totals $985 billion, a 21% decrease in five years. Wall Street bankers needed the money to pay themselves bonuses, so Ben Bernanke obliged. • The annual deficit in 2007 totaled $161 billion. Today, the annual deficit is $1.1 trillion. We add $3 billion per day to the national debt as a gift to unborn generations. • The national debt in 2007 was $9 trillion. Today the national debt is $16.3 trillion, an 81% increase in five years. The national debt will reach $20 trillion during the next presidential term. Normalization of interest rates to 2007 levels would result in annual interest expense of $1 trillion, or 40% of current government revenues. There is nothing normal about our current economic situation. The unfunded liabilities at the Federal, State and local levels of government accumulate to over $200 trillion. Do the facts detailed above lead you to believe we can return to pre-2007 normal in the near future, or ever? Not only has the economic situation of the country deteriorated enormously, the very culprits who created the disaster are more powerful than they were before the global catastrophe caused by their criminal risk taking. 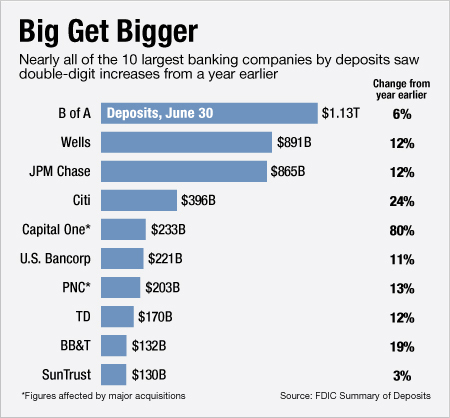 The largest Wall Street banks control 74% of all the deposits in the country, up from 66% in 2007, and double the levels from the mid-1990’s. These bastions of capitalism wield all of the power in this country, dictating who wins elections, who writes the laws, and who benefits from the distribution of wealth. Only in a corrupt, crony-capitalist, citadel of kleptocracy could the perpetrators of the greatest theft of national wealth in the history of mankind be rewarded with taxpayer financed bailouts, the ability to borrow an unlimited amount of fiat currency at 0% from a Central Bank they control, write the new banking regulations and be applauded by their corporate mainstream media for becoming even Too Bigger to Fail. This Fourth Turning will ultimately come down to a clash between the people and the Wall Street filth. History does not repeat but it does rhyme, because of the cyclical nature of human experience. The specific events that drive this Crisis are unknowable, but the generational response to these events can be predicted with uncanny accuracy. Each generation will play its assigned role during this Crisis. The current generational configuration will propel events and create a feedback loop that will change the course of human history on a scale consistent with the Depression/World War II, the Civil War and the American Revolution. The mood of the country continues to blacken. A simmering anger boils beneath the surface of an everyday façade of normalcy. The middle class majority is being squeezed in a vice, with the rich powerful plutocrats on Wall Street and in Washington DC stealing their hard earned net worth through financial scams, the gutting of our industrial base and a tax system designed to benefit those who write the laws on one side and the parasitic willfully ignorant underclass that is sustained only through the extraction of taxes from the working middle class on the other side. Our society has become a hunger games tournament, with the few benefitting while the many scramble to survive. The stench of class warfare is in the air. The generational resentment and rage is palatable as the Millenial generation has taken on a trillion dollars of student loan debt at the behest of the Federal government, Wall Street and older generations, only to graduate into a jobless economy. The generational contract has been broken, as the older generations will not or cannot leave the workforce due to their own financial missteps. Younger generations are being denied entry level positions, even as the older generations expect them to fund their retirements and healthcare. This presidential election will only exacerbate the anger, disappointment, bitterness and fury among the populace, no matter who wins. Can generational theory predict who will win the presidential election? Probably not, but based upon historical precedent, during times of Crisis the country usually turns to a Prophet generation leader who provides a new vision and summons the moral authority to lead. This leader may not have the right vision or have the backing of the entire population, but he is not afraid to take bold action. Franklin Delano Roosevelt was despised by many, but he boldly led the country during the last Crisis. Abraham Lincoln won the 1860 election with only 39.8% of the popular vote, but he unflinchingly did whatever he thought was necessary to achieve victory and preserve the union. Prophet leaders like Samuel Adams and Benjamin Franklin offered the sense of moral urgency required to sustain the American Revolution. Strauss & Howe give a historical perspective on Prophet generations. Barack Obama was born in 1961. According to the Strauss & Howe generational distinctions, this makes him an early Gen-Xer. His life story matches that of the Nomad archetype. His chaotic early life, confused upbringing by an array of elders, frenetic alienated early adulthood as a community organizer, and his rise to power through his public speaking talent and pragmatic ability to achieve his agenda is a blueprint for a Nomad. Mitt Romney was born in 1947 and grew up during the American High. His childhood was idyllic and privileged. His moral Mormon youth as a missionary eventually devolved into his yuppie “greed is good” career at Bain Capital acquiring companies, making them more efficient (firing Americans & hiring Asians), and spinning them off, while siphoning millions in fees. He has tried to convince Americans to vote for him, based upon his business acumen and moral lifestyle, as the cure for what ails America. With the continued downward spiral of societal mood, record low trust in Congress and 60% of Americans thinking the country is on the wrong track, the odds should favor the Prophet candidate. The 40% of Americans who think the country is on the right track are a tribute to our awful government run public education system or are smoking crack. The Barack Obama presidency has many similarities to the one-term presidencies of Herbert Hoover and James Buchanan. Both men were overwhelmed by rapidly deteriorating events, an inability to understand the true nature of the Crisis, and failure to inspire the American people to rally behind a common cause. Both men drifted off into obscurity and are overwhelmingly acknowledged as two of the least successful presidents. The men who succeeded them are ranked by historians at the top of the list, even though they are both despised by more libertarian minded citizens as proponents of big government solutions and control. Libertarians will not be happy with developments over the next fifteen years. This Crisis is an era in which America’s corrupt social order will be torn down and reconstructed from the ground as a reaction to the unsustainable financial pyramid scheme which is an existential threat to the nation’s very survival. Civic authority will revive, cultural manifestation will find a community resolution, and citizens will begin to associate themselves as adherents of a larger cluster. Barack Obama has fallen short as a Crisis leader, just as Buchanan and Hoover fell short. Buchanan also tried to maintain the status quo and not address the key issues of the day – secession and slavery. His handling of the financial Panic of 1857 led to annual deficits that exceeded 13% of GDP during his entire presidency. His legacy is one of failure and hesitation. Hoover was a technocrat with an engineering background who failed to recognize the extent of the suffering by the American people during the early stages of the Great Depression. It is a false storyline that he did not attempt to use the power of the Federal government to address the economic crisis. Federal spending increased by over 20% during his term and he was running a deficit when Roosevelt assumed power. Hoover was an activist president who began the public works programs that FDR expanded and dramatically increased taxes on the rich and corporations in 1932. Obama inherited a plunging economic situation and proceeded to make choices that will make this Crisis far worse than it needed to be. He has failed miserably in addressing the core elements of this Crisis that were foreseen by Strauss and Howe over a decade before the initial spark in 2008. Debt, civic decay, rising wealth inequality due to the rise of our plutocracy, and global disorder are the underlying basis for this Crisis. Obama’s response was to run record deficits driving the national debt skyward, failing to address the unfunded entitlement liabilities that loom on the horizon, bowing down before the Wall Street mobsters and paying their ransom demands, layering on more complexity and unfunded healthcare liabilities to an already teetering government system, and extending our policing the world foreign policy at a cost of $1 trillion per year. A Crisis requires a bold leader who makes tough choices and leads. Obama has proven to not be that leader. Based on historical precedent and the rapidly deteriorating mood of the country, it would be logical for the country to select Romney, a Prophet generation leader. No matter who wins the election, there will be no turning back. It isn’t Morning in America anymore. It is more like Midnight in America on a bitterly cold dark February night as the gale force winds begin to gust, foretelling the approach of an epic winter blizzard. There are no easy solutions. The opportunity to alleviate the impact of this Crisis was during the late 1990’s and early 2000’s, and we made all the wrong choices. Now we will pay the price. An era of depression and violence will be ushered in by an economic calamity that will make 2008 look like a minor blip. The next president will still be presiding over a country divided 50%/50%, with little or no common ground on most of the key issues that must be confronted. But, as we’ve seen in previous Crisis periods, bold leadership and history making decisions did not require consensus or even majority support. Only 10% of the colonial population drove the American Revolution. Lincoln was despised by half the country and not exactly loved by everyone in the North. FDR’s popular support progressively declined during his four terms in office. It is the Fourth Turning events, not the nation, which elevates the person to the apex of power. The regeneracy of the nation will occur during the next presidential term. The Millenial generation is coming of age faced with the burdens of $1 trillion of student loan debt, a stagnant job market clogged by the Boomer generation that can’t afford to retire because they never got around to saving, ever increasing taxes to fund the promises made to their elders by politicians, and an unfunded entitlement liability of $100 trillion for healthcare and pension benefits they will never see. The mathematical impossibility of sustaining our economic system is absolute. It will require courage, sacrifice, fortitude and a dramatic shift of our egocentric selfish culture to a culture of sustainability and caring about future generations. We’ve made many bad choices over the last few decades. Choices matter. These are the times that will try men’s souls. The choices we make as a nation over the next few years will determine whether this Fourth Turning ends in a renewal of our founding principles or tragedy. Glory or ruin – the choice is ours. • The inevitable breakup of the European Union with the consequences of massive bank defaults in Europe triggering worldwide bank defaults as the interconnected trillions of derivatives are lit like a string of firecrackers. • A sudden Greece like surge in interest rates on Japanese bonds results in a collapse of their debt ridden economic system, with reverberations throughout the world. • The Middle East tinderbox explodes as Israel attacks Iran and the law of unintended consequences takes hold. Alliances and treaties would draw Turkey into war with Syria and Iran. Russia and China could side against the U.S. Iran and their vassals would unleash terrorist attacks and disruption of Middle Eastern oil would drive prices over $200 per barrel, crushing the American economy. • A showdown on the debt ceiling and/or fiscal cliff results in a stock market crash, derailing the pitiful fledgling recovery created by Ben Bernanke’s QE to infinity measures. • A tipping point is reached with regards to the amount of debt that can be accumulated by our Federal, State and Local governments. A cascade of defaults could lead to a loss of faith in the U.S. dollar and a surge in interest rates. The defaults and increased interest on the national debt could lead to mass depression or in a worst case scenario – hyperinflation. • A large terrorist attack in one or more American cities would cause chaos, panic and fear, leading to more government control over our daily lives. This could trigger a counter response by those fed up with an overbearing government presence. • A catastrophic natural disaster or series of natural disasters would reveal the fragile nature of our just in time economic system. A breakdown of our logistical and infrastructure systems would lead to chaos and mass hysteria as the citizens who believed their government leaders would keep them safe, secure, warm, and fed realized it was all a sham. Their leaders were in it for the power and riches, not looking out for the best interests of the common folk. No one knows for sure what will trigger the next leg down during this Crisis, but I can guarantee you that things will not be getting better in the near future. Don’t believe the mainstream media or politicians who tell us life in the good old U.S. of A will be back to normal in the near future. And those who predict a long slow gentle decline of the American Empire that can be managed by the oligarchs are badly mistaken. That is not how things roll in a Fourth Turning. Transformative change, chaos, desperate measures, and total war will propel our nation through this cataclysmic saeculum and a positive outcome is not assured. An armed conflict – class war, sectional war, religious war, or war for oil – will be waged at some point and fought to the finish. Fourth Turning wars do not end inconclusively. Each Fourth Turning war has resulted in greater destruction and more horrendous numbers of human casualties. The trials and tribulations that await this nation over the next fifteen years will challenge every living generation to play their roles and bravely confront the tasks needed to reach a new High, just as their ancestors did. For those who doubt generational theory and believe history is a linear path of human progress, I would point to the last week of chaos, disarray, government dysfunction, and misery of those who didn’t prepare for Superstorm Sandy, as a prelude to the worst of this Crisis. The lack of preparation by government officials and citizens, death, destruction, panic, anger, helplessness and realization of how fragile our system has become is a perfect analogy to our preparation for this Fourth Turning. The brittleness of our infrastructure and lack of redundancy in our systems has left us vulnerable to any large storm. Building mansions yards from a dangerous unpredictable sea is akin to allowing Wall Street bankers to create interconnected financial derivatives which will ultimately result in a great worldwide flood that will obliterate billions of wealth. Going decades without upgrading our power grid, transportation systems, or storm protection is akin to allowing our unfunded entitlement liabilities to accumulate to such an extreme level that it will be impossible to honor and the coming storm will swamp those depending on those promises. The lack of foresight by citizens in having food, water, and backup sources of power and heat in case of an emergency is akin to the millions of people that have lived the good life in debt up to their eyeballs while never saving for a rainy day or their retirement. When the rainy day arrives they panic and demand to be saved by an inept bureaucratic government. Winter has arrived. The gathering storm is about to strike. Are you prepared? This entry was posted in Collapse 2012 and tagged Economic Collapse, generations, Great Depression, The Fourth Turning, William Strauss & Neil Howe. Bookmark the permalink. My background is 4 decades on Wall Street. Would a deflationary spiral fit into a 4th tirning prophesy? I enjoy your writing and assessment and feel it is important. That’s a good question. There have been many polarized views about it. Some say we’re going into a deflationary (or disinflationary) period. Others are firmly in the hyper-inflationary camp. I think they’re both a false dilemma (“either/or.”) It’ll likely be both in what might be called stagflation. We’re already seeing deflation in what we own and inflation in what we owe. Our assets (other than artificially pumped-up stock markets) are decreasing in value, our wages are decreasing in purchasing power so what we owe to the banks and credit card companies will increase. I think this divergence will spread further as time goes on. We likely won’t see hyper-inflation but the stagflation will be painful. I like how you’ve got a more global perspective in your analysis. Globalism and the internet have made this a global 4th turning, not just an American 4th turning. One thing I have thus far not seen anyone mention is ending with a whole new political system. I see talk of leaderless movements and participatory democracy coming from many countries. Perhaps that will end up being the decisive change in the end. Good point! There’s bound to be a major political change. It’ll be interesting to see how that plays out.